Sir Philip Craven MBE is a wheelchair basketball player with an outstanding athletic career. Winner of the Gold Medal at the World Championships in 1973 and the European Championships in 1971 and 1974, he has participated in no less than five Paralympic Games in wheelchair basketball events (1972-1988) and swimming (1972). From 1988 to 2002, Sir Philip was President of the International Wheelchair Basketball Federation. 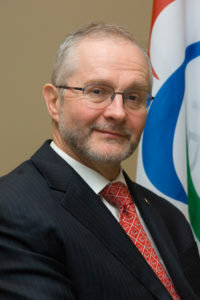 He became President of the International Paralympic Committee (IPC) in 2001, and an IOC member in 2002, two functions that he still holds today. In 1991 Sir Philip was decorated as a Member of the Order of the British Empire (MBE) by HM Queen Elizabeth II for services to wheelchair basketball. He also holds an Honorary Doctorate in Law from the University of Nottingham and an Honorary Doctorate from the University of Staffordshire.